Located a short distance from the Colosseum, Santi Giovanni e Paolo is our stop for today. Named for the martyrs of the fourth century, this church is dedicated to two wealthy brothers who served in Constantine’s court under his daughter, Constantia. She converted them to Christianity and they would host Christian rites here in their home. When the emperor Julian came to power, he wanted them to deny their faith and embrace paganism. They refused and were martyed inside their home. They were buried here on the property and their tombs were venerated by friends. The emperor did not like this and had three people decapitated at the tomb, Crispin, Crispianus and Benedicta. 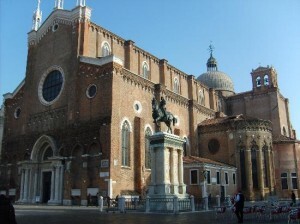 In 398, a wealthy senator, also a friend of Saint Jerome, had a basilica built over the home of these martyrs. This titulus was dedicated the Basilica of Saints John and Paul. Excavations begun in 1887 revealed two houses, known as Case Romane, dating from the second century, and an oratory dating from the fourth century. The tomb of the martyrs is located in the church as well as the tomb of Saint Paul of the Cross. In union with the whole Church we honor Mary, the ever-virgin mother of Jesus Christ our Lord and God. We honor Joseph, her husband, the apostles and martyrs Peter and Paul, Andrew, James, John, Thomas, James, Philip, Bartholomew, Matthew, Simon and Jude; we honor Linus, Cletus, Clement, Sixtus, Cornelius, Cyprian, Lawrence, Chrysogonus, John and Paul, Cosmas and Damian and all the saints. May their merits and prayers gain us your constant help and protection. Tomorrow we travel to Sant’Agostino.